Dr. Nicole Hamel, DC, CCSP grew up loving sports. She loved playing them and having grown up with only one tv ended up watching them a lot on Saturday mornings with her brother. She was lucky enough to be able to play varsity volleyball and softball in high school which was an amazing experience and their teams were even able to go to state. 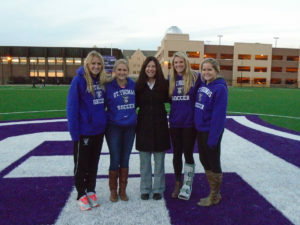 Going to college at the University of St. Thomas she knew that she wanted to combine her passion for sports with her love of helping others and that’s how she became a student athletic trainer. Dr. Nicole was able to get over 300 hours of experience with athletes treating and preventing injury especially as the trainer for Men & Women’s Soccer, Men & Women’s Indoor & Outdoor Track, and for Baseball. During chiropractic school at Northwestern Health Sciences University Dr. Nicole studied and became certified in acupuncture and cupping. This has added more natural options of alleviating pain & shortening recovery time for her athletes. She graduated from chiropractic school, opened her own practice, and after years of practicing learned that she could specialize in sports chiropractic and did so by doing more intensive study in that area, passing 7 exams, and a final board certification exam in CA. Dr. Nicole feels very grateful that she is able to combine her passion of sports with her love of helping others. 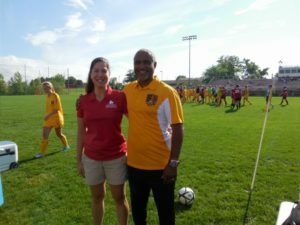 She is currently the Team Chiropractor for the Minnesota TwinStars FC and treats lots of athletes who are beginners, experienced, and also families who want to stay healthy & active with gentle chiropractic, acupuncture, and cupping. Her favorite role is being a wife and mom to 3 active kiddos who she is of course, their #1 fan! Dr. Nicole has been amazing through all of my 3 pregnancies and has also helped 2 of my kids with some of their issues. I had severe sciatic pain and she was better than the pain killers prescribed from my doc. When I get a rash of headaches, it takes one appointment for an adjustment with her to take care of them. She is knowledgeable, gentle and always has the best interest of her patients in mind. I have never felt she has recommended treatment just to get a bigger financial gain from working with me. I would highly recommend her to anyone--especially skeptics to the world of chiropractic.